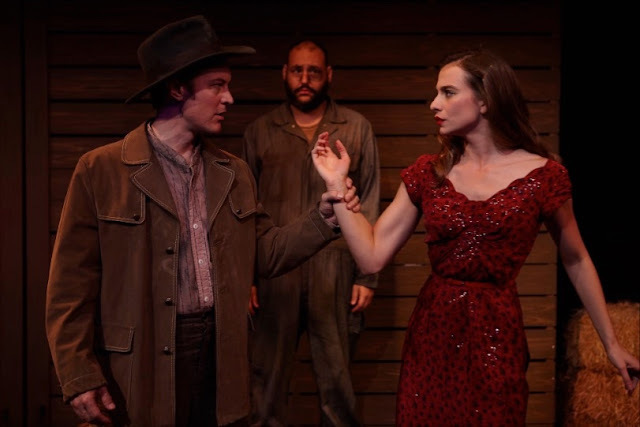 Carol's Theatre Reviews ~ It's Fun To Go Out: The Best Laid Schemes “Of Mice and Men” Often Go Awry. The Best Laid Schemes “Of Mice and Men” Often Go Awry. 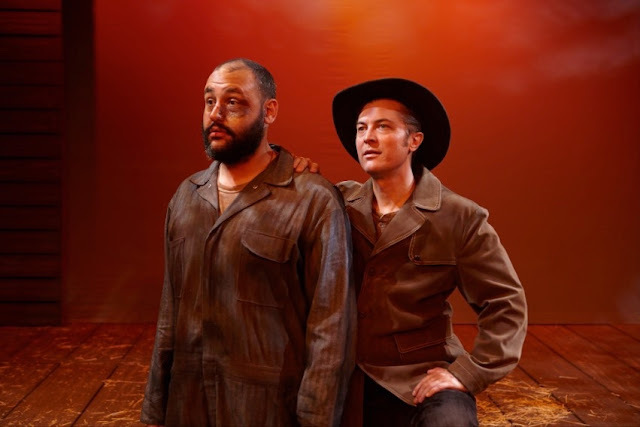 At the opening night performance of director Richard Baird’s striking vision of “Of Mice And Men” at the North Coast Repertory Theatre through Nov. 12th, John Steinbeck’s Biblical parable was so intense you could hear a pin drop. Steinbeck, who wrote from his own experiences growing up in Salinas Valley doing farm work to help support him through Stanford University, first conceived “Mice and Men” as a play although it was written as short story. “Of Mice and Men” is the tragic account of two itinerant ranch hands looking for work in Salinas, California during the Depression of 1937. They are diametrically opposite in personality and size but still cling together for companionship, protection mutual dependency and loyalty above all. The one thing Lennie doesn’t seem to understand is how strong he is. George does his best to look after Lennie, speak for Lennie and see to it that Lennie stays out of trouble but trouble follows as night follows day. In casting Mongiardo-Cooper and Sidney, Baird’s visual couldn’t be more striking it if he tried. Mongiardo-Cooper’s size might just be enough to make anyone shy from him, especially after knowing his background. Yet his demeanor and speech only give away his mental instability not his physical strength. But the contrast is so that it’s impossible to take your eyes off them especially when George, exhibiting a Napoleon complex, edges up to Lennie when he tries smooth over anything Lennie might have done to attract attention. 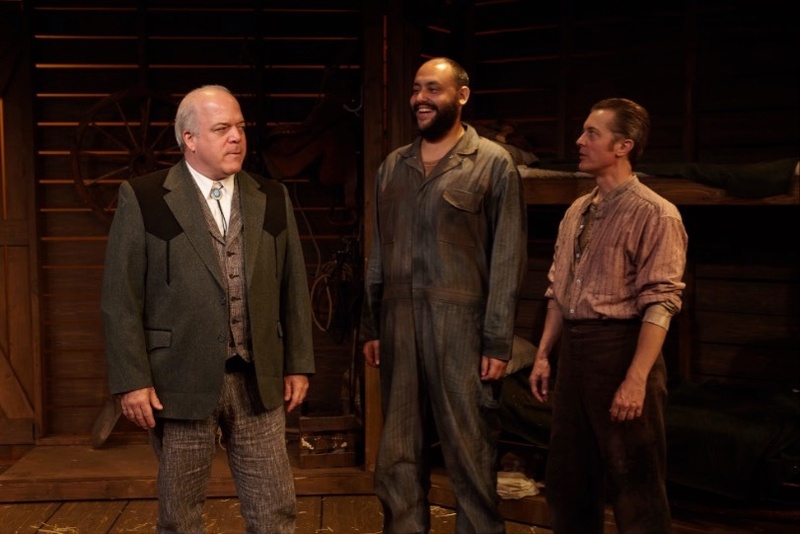 Lennie, shying away pulls into his ample sized body fearing that he might get hurt. It’s almost too painful to watch. It’s a pie in the sky notion, but it keeps the two bound together as Lennie probes George to tell and retell the story even though he knows it by heart. Steinbeck’s classic “Of Mice and Men” is like a magnet. No matter how often one sees it, new revelations cause aha moments and even the most seasoned theatre- goer cringes knowing of ‘the best laid plans’. Director Baird has assembled a gruff and gritty enough group of hands to maintain that comfortable feeling that each and every one of the hands belonged in that bunkhouse doing whatever it took get through the day. In the bunkhouse, where most of the action takes place, few question are asked, the men go about their business as usual. They play cards and talk of the day’s work. 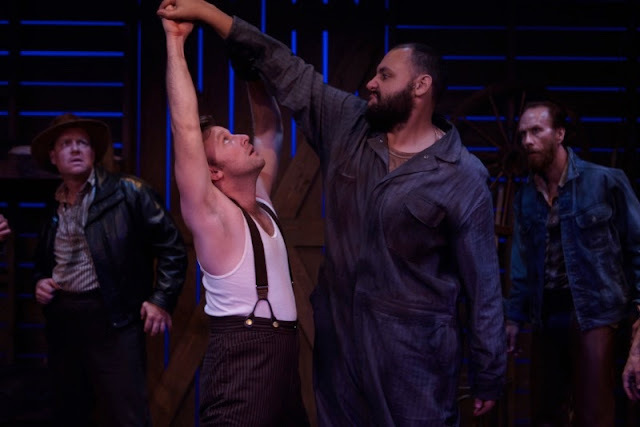 Coming and going is a way of life and Lennie and George fall in lockstep with Slim (J. Stephen Brantley, the mule- skinner), the ranch hand Wit, (Justin Lang) and the boss in charge (Ted Barton), whose bark is worse than his bite. John Greenleaf’s Candy rings true as the ranch handyman after losing his hand in a work related accident and worries that his usefulness at the ranch will soon find its way to the boss. Wanting to hook up with Lennie and George, he reveals that he has money saved up to help the two move their dream along and is willing to overlook anything Lennie does to get out of Dodge. Max Macke’s Carlson stands out as cold and calculating ranch hand. His convinces Candy that he should shoot his sheep dog Sonny and put him out of his old age agony. With nudging every time the dog is in the bunkhouse he offers to do it for him. Macke is a made to order Carlson. His off handed cruelness almost makes you shudder and when the gunshot is heard. It’s enough to want to cry. 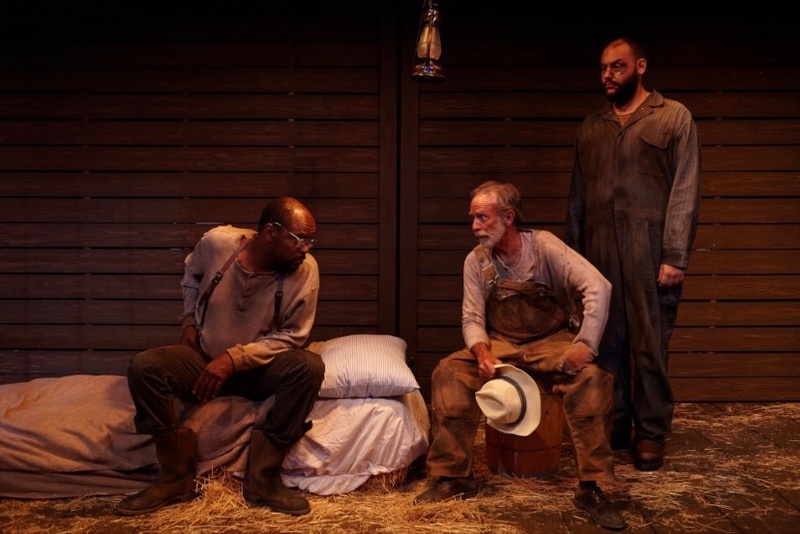 In a room all to himself Lawrence Brown’s Crooks, the black stable hand, shows the most kindness after being startled by Lennie, in a moving scene where color doesn’t matter, intelligence is just word and humanity knows no bounds when he too wants to hop on the Lennie and George dream. He wants to go with them and work in the garden; the same garden that will grow the alfalfa for Lennie’s rabbits. Brown’s award winning portrayal, seen recently as Cornwall in August Wilson’s “Seven Guitars”, is revisited on his impressive depiction of the lonely and sympathetic Crooks; angry that some might be imposing on his space yet welcoming the chance to have someone close by. Curley’s wife, who remains nameless (even Candy’s dog has a name), brings about another cultural gap in the blatant misogyny and prejudice prevalent still, as some refer to her as the troublemaker or whore, is on the long list of the lonely and displaced. She continually breaks the rules by coming into the all men’s bunkhouse looking for something, someone; and it’s not her husband. In an assertive move to show how soft her hair is she insists Lennie touch her long soft locks that in turn sets into motion the highly charged and emotionally draining ending. Ms. Jolene is at her best in that last visit to the bunkhouse. Another gunshot rings out marking the end of a troubled friendship bound together by loneliness and dreams. George, the ever-faithful friend and brother, companion and protector sets his companion free from the bonds that defined his life. Steinbeck’s “Of Mice and Men” opens on the sandy bank of the Salinas River. Two iterant workers filled with dreams of owning their own spread share their dreams and set their long trek into motion. It ends on that very same sandy bank of the Salinas River. All hopes are dashed, Lennie is dead and George is just another drifter, alone. With excellent technical support from Marty Burnett’s functioning, slatted bunk house with four bunks, a table and a few chairs, Matt Novotny’s excellent mood lighting, Aaron Rumley’s sound design, Andrea Gutierrez’ props and Elisa Benzoni’s well worn, stained and ruddy costumes, not to mention Baird’s insightful and fluid direction, Steinbeck’s “Of Mice and Men” is another outstanding piece of work not to be missed.